I’ve had about a week to play with the new Dropcam Pro and I’m pleased to say I haven’t noticed it at all since I set it up. And that’s a good thing. The Dropcam Pro is a wireless video surveillance camera with a lot of great features. It costs $199 and the DVR service costs $10 per month. This lets you record everything that happens for seven full days, offering a 24/7 view on your world. It connects to any wireless network – the new model supports 802.11b/g/n 2.4GHz and 5GHz, a massive improvement, and it has better night vision, HD recording, and a nicer case. It also has a 130-degree field of vision, 20 degrees more than the original model. In short, it’s 100% better than its predecessor and its predecessor was still pretty darn good. It works like this: you connect the Dropcam to a computer and set up your wireless network and account. Then you let the Dropcam record. According to CEO Greg Duffy, his company processes more video per day than YouTube and it’s easy to see why. Every time something happens in front of the camera it marks that point in the recording and can even notify you. A built-in mic and speaker lets you listen and talk to interlopers and the night vision system uses infrared LEDs to create a slightly creepy but entirely visible scene. Dropcams are, in short, the best way to keep tabs on your home or office. They’re unobtrusive, you can turn off the front indicator light, and they run off of a standard USB cable. You can put them anywhere – you will notice glare if you try to shoot night vision through a dirty window so almost anywhere – and they are extremely well-built. I’ve been consistently impressed with the experience and the Pro model is a real improvement. A little bit more magic and you can get a clearer picture of the scene. You can then enhance a part of the scene, as shown below. While you’re obviously not going to get perfect results each time, it is a cool experience to truly “Zoom! Enchance!” a live scene. Who is this for? Small business owners, home owners, and folks who don’t want to waste their money on chintzy babycams and instead want something that actually works. 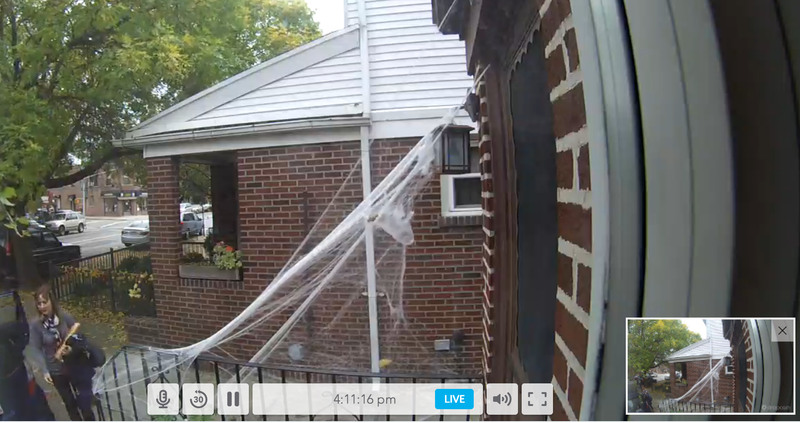 We’ve used Dropcams to keep an eye on the kids, watch our car outside, and even figure out who is ringing our doorbell. I could see these replacing the chintzy CCTV cameras in mom and pop shops and offices and because everything is recorded you’ll never lose a minute of the action. I’m not the kind to heap praise on a device but after setting and forgetting the Dropcam Pro I’m pleased to note that I’ve never had to go to tape in order to solve a crime or, for that matter, identify the manufacturer of a replicant’s robotic snake by enhancing 224 to 176.